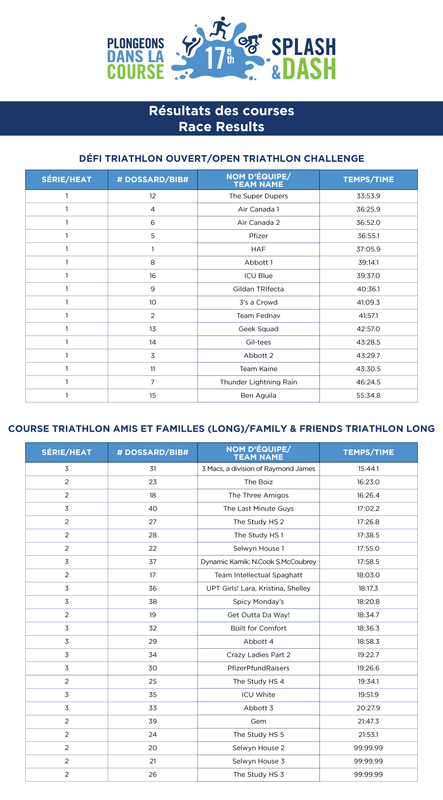 Montreal, November 5th, 2018 — On the morning of Saturday, November 3th, 2018, Sarah’s Fund for the Cedars Cancer Foundation will be coming together with the Montreal Children’s Hospital community for the 17th Annual Splash and Dash. Splash and Dash. The signature event for Sarah’s Fund for Cedars raises critical funds for the needs of young cancer patients who are hospitalized on Sarah’s Floor, the in-patient Hematology- Oncology division, at the Montreal Children’s Hospital. 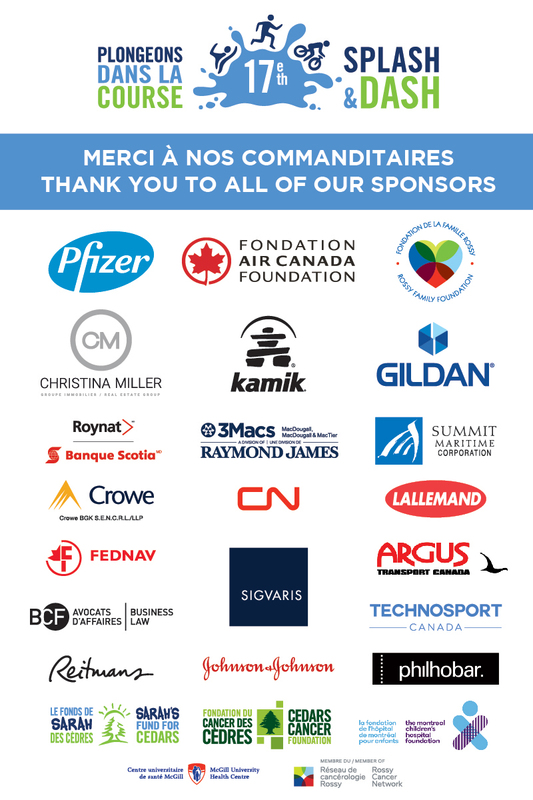 Thanks to the enthusiastic giving of Montreal community corporations and through special events, Sarah’s Fund has raised over 12 million since 2001. 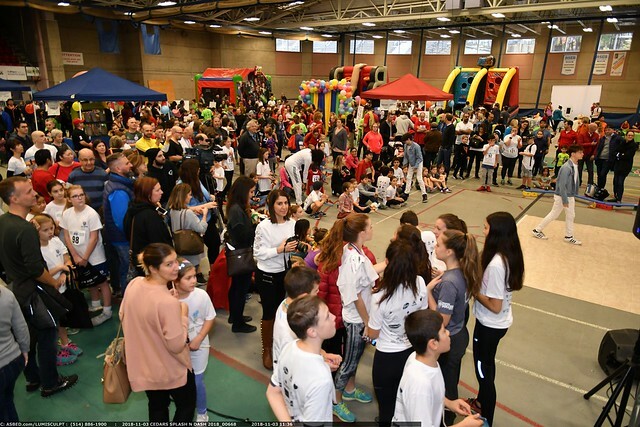 Bright and early on Saturday, November 3rd, 2018, over 500 people including 300 race participants gathered at the McGill Sports Complex for the 17th edition of Splash & Dash, which raises funds for Sarah’s Floor at the Montreal Children’s Hospital through Sarah’s Fund for Cedars. Each team made up of three people ranged from families with young children to corporate teams. What these teams all had in common was a desire to bring awareness, raise necessary funds and help Sarah’s Fund for Cedars Go Beyond their wildest dreams for paediatric oncology. Splash & Dash raises money for Sarah’s Fund for Cedars, founded in 2001 by a then 8-year old girl undergoing treatment for Ewing’s Sarcoma. Since its inception Sarah’s Fund has raised over $12 million to support the needs of the Hematology-Oncology division at The Montreal Children’s Hospital. All races that took place throughout the day had three components: run swim run or swim bike run! The high energy, family friendly competition was accentuated by the spirited music, blow up attractions, fantastic food and tantalizing raffle prizes! The annual Heroes & Celebrity race was as always, the day’s highlight. Local Montreal celebrities raced with the true heroes of the day, the patients of Sarah’s Floor. 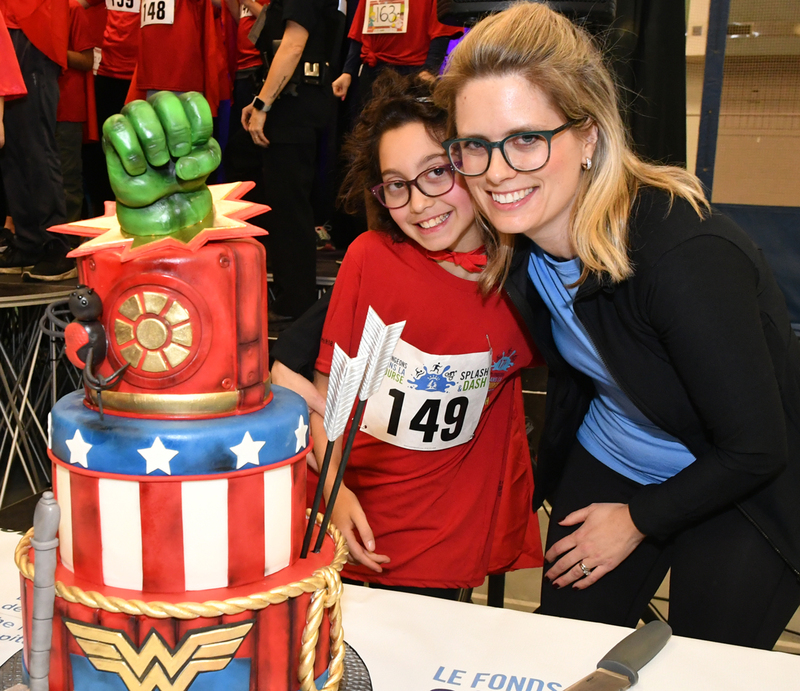 With bright smiles and resilience that inspired all who attended the day’s participants gathered to watch the Heroes race; a powerful reminder as to why the Montreal community has come together for the past 17 years for Splash & Dash and Sarah’s Fund for Cedars. The 17th edition of Splash & Dash would not have been possible without the incredible help of the Gold Sponsors: Pfizer, Christina Miller Real Estate Group, Air Canada Foundation, Gildan, Kamik, 3Macs/Raymond James, Rossy Family Foundation and Summit Maritime Corporation, .A huge thank you as well to the Race Sponsors: Argus Transport Canada, BCF LLP, CN, CroweBGK, Fednav, Lallemand, Philhobar, Roynat Scotia Bank, Sigvaris, and Technosport Canada The day would not have been the success it was without the dedication, enthusiasm and support of our volunteers. All proceeds from Splash & Dash will support Sarah’s Fund for Cedars who has made its mission to make a meaningful difference in every child’s life that has been touched by cancer at the Montreal Children’s Hospital. The mission of the Cedars Cancer Foundation is to support the Cedars Cancer Centre at the MUHC and Sarah’s Floor at the Montreal Children’s Hospital by providing exceptional patient care, treatment, research and training benefitting the Cedars’ pediatric, young adult, palliative and adult philanthropic missions. in North America including Hawaii, Mexico and the Caribbean. 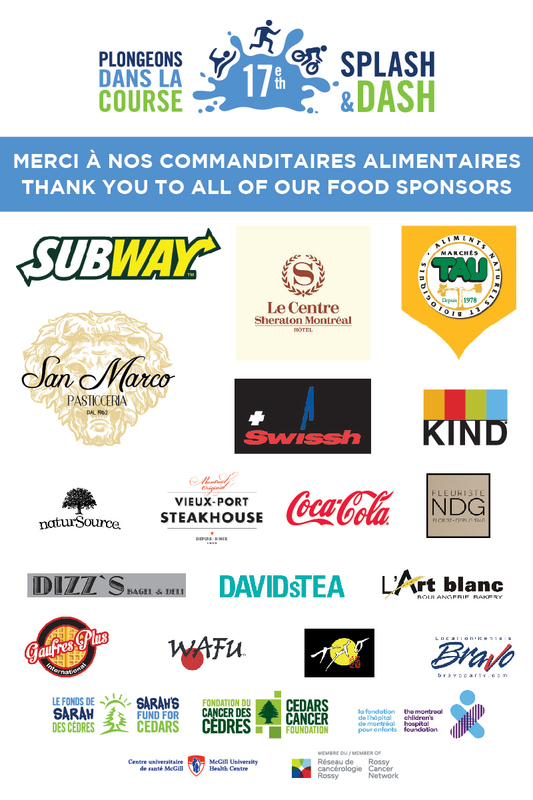 Please e-mail: Wendy Lutfy at the Cedars Cancer Foundation at: wendy.lutfy@cedarsevents.ca or call 514-656-6662 ext: 332 to claim your prize. I'd like to first and foremost thank everyone who came out to celebrate Splash and Dash’s 17th edition. Whether you were a Hero, a participant, a volunteer or just someone who came out to celebrate with us, on behalf of the organising committee, who spends countless hours planning, making this day possible, I thank you. 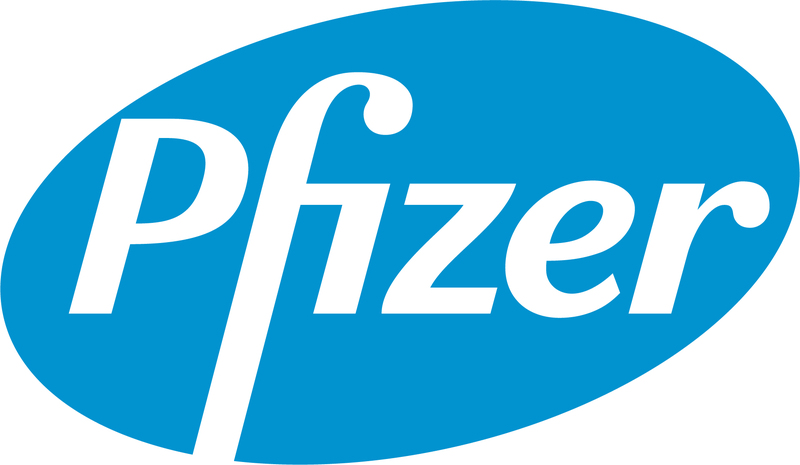 Thank you to Pfizer, our title sponsor, for its continued commitment to Splash and Dash, as well as to all our wonderful sponsors. Splash and Dash would not have been possible without your incredible and continued support. Thank you to our dedicated volunteers who have come out year after year to help us out and help make Splash and Dash what it is. It was so wonderful to see you all in your neon shirts. You all shone so bright - I need sunglasses from the glare. Thank you to our Heroes, patients on Sarah’s Floor, survivors. You are the reason we are here. Your bravery, determination and strength make you true super heroes in all of our eyes. To our local Montreal celebrities who came out to participate for our annual Heroes & Celebrity race. Thank you. Thank you to the Cedars team who was a constant source of support and professionalism. I wouldn’t have made it to this day without your tireless effort and behind the scenes help. A very special thank you to Wendy Lutfy for all your hard work and help throughout the planning process. Thank you to Christina Antoniou our sponsorship committee chair and to the sponsorship committee for all their hard work soliciting our corporate sponsors. Thank you to the organizing committee who spent countless hours preparing for this day. Thank you to a group of people who’s always ready to roll with the punches and always remembers that this day is all about having fun. I couldn't be luckier to have such a dedicated team to work with. And lastly Thank you to Sarah, Lorena and Norman Cook for continuing to believe in my leadership skills and giving me the privilege to make Splash and Dash GO Beyond its wildest dreams and continuing the vision Sarah had 17 years ago. We hope to see you all again next year as we celebrate life and 18 years of Splash and Dash. Summit Maritime Corp. Summit Maritime Corp.
162511 Canada Inc. 162511 Canada Inc.
Raymond James Ltd. Raymond James Ltd.